One species in particular that have evolved into a polygynous existence, Myrmica rubra, also known as the European Fire Ant, have been known to house many dozens of queens within a single colony! Due to this rather resourceful trait myrmica rubra colonies can quite effortlessly explode into colonies of thousands in a short space of time! Not that it’s a surprise with so many egg laying machines dug into every dark depth of a nest! Myrmica rubra colonies can make the perfect house pet for any ant keeper so long as you don’t fear their tiny stings, which can be described as similar to the stinging sensation you get if you’ve unfortunately met the wrath of a unsuspecting stinger nettle. One man in particular, who some may say has quite the obsession with Myrmica rubra, Marco Demants, currently houses a total of six colonies with varying numbers of queens. His largest current colony houses 30 queens and quite an impressive force of workers! Although Marco has only kept Myrmica Rubra for a short time of approximately ten months, his fascination with them has resorted to extensive research and self observation of the species! During his short time of dealing with these ants, he has managed to gain himself the reputation of “The rubra king” amongst quite a few members of the Ant Keeping UK Facebook page by offering very useful advice to all, whilst also showing off his impressive colonies through pictures and videos via Facebook and Youtube. His Youtube account has extensive videos of ant keeping which can be found here. During a brief conversation he stated “I get tagged in posts literally all day every day on anything about Rubras!”. Well Marco, that’s the price of being a king! A couple of main things that developed Marco’s love for the Myrmica rubra was their aggression and hardiness. Firstly, the aggression of the ants had impressed him when he had observed that the M.rubra workers would fearlessly attack almost anything that stood in their way, no matter how many times larger than themselves. Perhaps putting a finger near these warriors wouldn’t be the best of ideas. Secondly, the ants overall hardiness. Marco is not only an ant keeper, but a formicarium builder/trader and also an ant dealer! Being an ant salesmen has proven to Marco that ants can be quite vulnerable during the treacherous mailing process, with many losing their lives on the journey (As many of us ant keepers have experienced. Stay strong)! 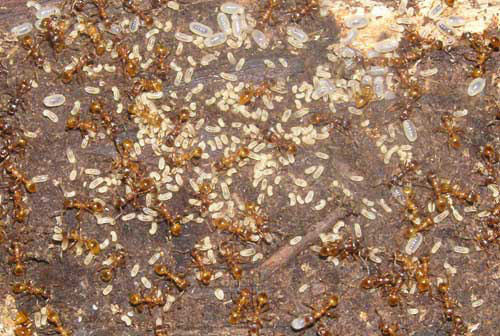 However, he has found that the toughness of these ants has been proven through the lack of fatalities during shipping. These ants must certainly be on the muscle juice! Throughout the period of time Marco has kept Myrmica rubra he has studied them carefully, always on the lookout for things that have gone unnoticed to other keepers. “When a colony has so many queens it is very easy to see the contrast of their colours, some being considerably lighter than others.” This normal occurrence peaked an interest for Marco, so he decided to monitor each queen individually. He soon came to a noticeable hypothesis that “The darker the queen, the more fruitful she was, laying many more eggs than her lighter coloured counterparts”. However, this is not scientifically proven and only his personal findings. Polygynous colonies, as expected, have an egg production rate that completely overshadows any single queen colony, making them a truly remarkable spectacle when watching them develop. Marco’s largest multi queen colony of thirty, that he had in fact caught himself in his very own garden from a nest housing a complete cohort of queens (He made sure to leave queens within the nest to prevent complete destruction) originally had no brood on capture. After three weeks of settling into their new home in Eden, his homemade formicarium, where food fell from the sky and graced their stomachs endlessly, the thirty queens has begun to produce and had already accumulated approximately two/three thousand eggs! Can you imagine it? I can. A big marshmallow of ant babies crammed into a tight space. If you are interested in becoming an ant keeper, perhaps Myrmica rubra are not the best of species to start off with. However, for those slightly more brave that are considering purchasing a fast growing, polygynous colony, maybe the fearless, hardy, stinging nettle injecting Myrmica rubra would be the ideal choice for you! How bad can it be?